Yesterday, it was revealed that cookbook author and TV chef, presenter and teacher Katsuyo Kobayashi (小林カツ代) had died on January 23, 2014. (The name for her profession in Japan is 料理研究家 - ryouri kenkyuuka - a cooking researcher.) She was 76 years old. Her death was not a big surprise, since it was known that she has been ill for some time now (she had a subarachnoid hemorrhage in 2005, when she basically stopped most of her professional activities), but it's still very sad news for me. To international audiences, she is probably best known for her memorable appearance on the original Iron Chef. She was in Potato Battle 1. Spoiler (well it is 20 years old): she beat Iron Chef Chinese Kenichi Chen handily. Here's the video. In Japan, in her heyday she was everywhere, usually dressed in the spiffy black and one one-shoulder apron she designed herself. (I've always wanted that apron - it looks so practical.) She published nearly 200 books, mostly cookbooks but also some wonderful little essay collections. 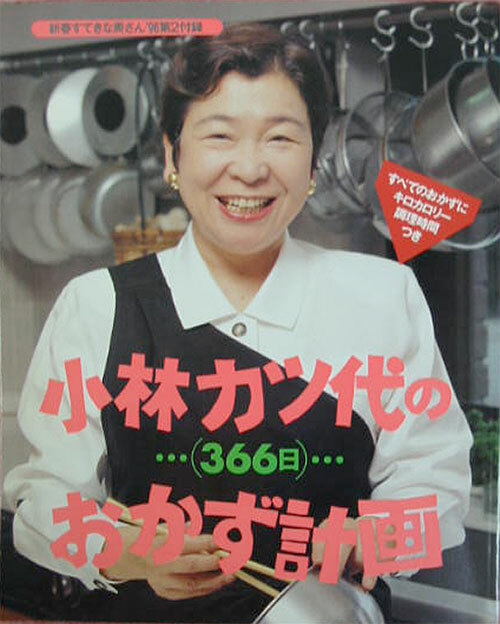 She made her first TV appearance in 1969, and was a fixture on the venerable NHK Today's Cooking show for at least a couple of decades. She also designed kitchenware and handy household items, some of which are still in production. 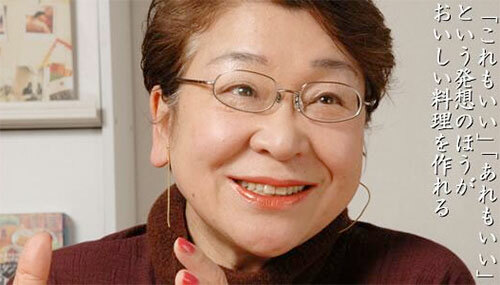 At the height of her career, in the 1980s to the early 2000s, she was known as Japan's Mother. 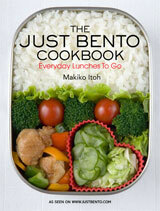 Her son, Kentaro, is also a very popular cookbook author and TV cooking personality. I've always thought it was so neat that her son decided to follow in her footsteps (she also has a daughter) somehow. There are quite a few mother-daughter and father-son cooking personalities in Japan, but not many mother-son (or father-daughter) combinations. I wrote about how much of an influence she was for me back in 2006. My list now has changed a bit...but Julia Child and Katsuyo Kobayashi are my eternal top two of all time. Neither were professional restaurant chefs, and they never pretended to be. However, they were both terrific teachers, and wrote clear, easy to follow recipes that worked. I have lost count of how many of Mrs. Kobayashi's books I have - more than 20 I think - and almost every single recipe I have tried of hers works, and usually tastes great. Her aim was to create home cooking dishes that were "easy, but didn't cut corners". That is the kind of recipe that I like to write the most too, and what I aim for for most of the recipes here, and all the recipes in my book. This is the very first book of hers I got. It actually wasn't a book...it was a bonus booklet of sorts included in an issue of a housewife magazine called Suteki na Okusan. It had 366 days worth of menus (I think it came out in 1996, a leap year), and a recipe for every day too. I wore my copy out so much that the cheap spine (it was a free extra after all) fell apart. Even if I die, I'm so happy that my most delicious recipes will live forever in people's homes. Japanese graves do not have epitaphs usually, but if there was one for hers, that would as fitting as any. Submitted by maki on 2014-01-29 14:12. What sad news. I remember watching that episode of Ryori no Tetsujin when it first aired in Japan (oh, how that ages me). Of course I knew of her before then, but that show turned me into a real fan. I loved how down-to-earth and cheerful she always was. And yes, I love that apron too. Sad to hear this. I remember her on Iron Chef as well as from your previous posts. Are any of her cookbooks or recipes available in English? One of her books was translated to English and it's still available I see. Quick and Easy Japanese Cooking. Sad news indeed. She had such an infectious smile. Her English-language "Quick and Easy Japanese Cookbook" (Kodansha) is one of our household favorites. Thank you, and rest in peace. Thank you for this lovely post. I wasn't familiar with Katsuyo Kobayashi but will seek out some of her books, on your recommendation, assuming I can find them translated into English. I love her quote about her recipes living on, that's a lovely thought. A lovely tribute! She and Julia Child both had a presence in the culinary world that was without pretense. You are correct that they were excellent teachers! Thank you for this post. Gosh, I'm sorry to hear that. I remember seeing that Potato Battle on Iron Chef, so many years ago! And I also have a lot of her son Kentaro's cookbooks. I really like them. My deepest sympathy on the loss of your amazing friend. I did an Internet search, and you can purchase that apron on Rakuten from a store called apron-story. It's a little more than $36 USD, plus shipping. I couldn't find the seller apron-story. Can you add the URL for the apron on Rakuten? I also have the same freebie mini cook book from sutekina okusan! I loved her cooking style. Her bold assertive style was a nice change from the frilly housewife look the Japanese media seemed to love. I'm so glad her son followed in her footsteps. Thank you for including the video so that those of us unfamiliar with her could appreciate her appeal and power. So beautiful, so talented, she commanded the stage with a smile. Thank you so much for introducing me to this genius cook! How, in all our searches for Iron Chef re-runs did we ever miss her star turn on this show? This is mastery far beyond haute cuisine... ;-> thanks again, Maki-san! "and almost every single recipe I have tried of hers works, and usually tastes great"
Actually I was thinking exactly that about your recipes and came here to check up on nikujaga.. I'm sad to hear this. My sweet mother-in-law gave me her "Quick and Easy Recipes" book when I was a newlywed, wanting to try my hand at some dishes for my 日本人hubby. That was about 8 years ago, and several recipes in that book have become household favorites.